Apr. 19th, 2007 16:46 by — Permalink | TrackBack: http://boursomac.com/trackback/471 — updated on Apr. 22nd, 2007 21:30 exists for 12 years & a week ago — — Sorry, this content is not available in english. - MacWorld UK. We all know that AT&T -- formerly Cingular -- will sell the iPhone in the US thru an exclusive agreement with Apple, starting in June this year. But we still looking forward to see what carrier will sell iPhone in Europe. 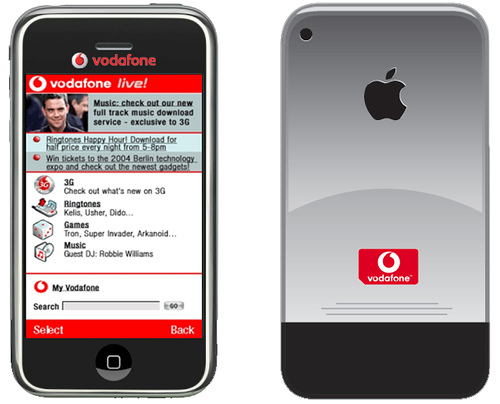 Looking around for the biggest carriers, everyones eyes would turn to Vodafone (200+ millions subscribers). This question still remains to be answered as Vodafone denied to have closed any agreement with Apple, hence, Vodafone won't distribute the iPhone. As we are moving forward, we are really impatient to hold this jewel in our hands!